The Rainbow Fish will include an original stage adaptation of Marcus Pfister’s colorful story as well two of the author’s companion tales, Rainbow Fish Discovers the Deep Sea and Opposites. The internationally acclaimed Mermaid Theatre of Nova Scotia presents innovative puppetry, striking scenic effects, and evocative original music to provide very young audiences with an effortless introduction to the performing arts and the excitement of reading. Relaxed performances feature modified sound and light levels, specially adapted pre-performance materials, and quiet lobby areas for individuals on the autism spectrum and those who may have limited movement, sensory and/or complex communication needs. Audience members of all ages and abilities welcome! 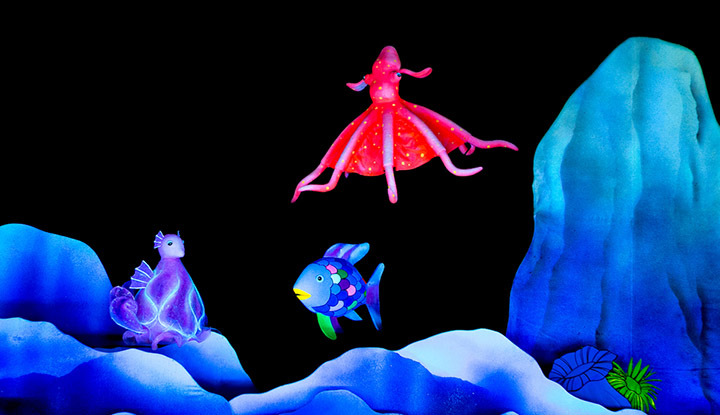 Explore the original story of The Rainbow Fish through craft-making, music and theater. Each participant will make a craft to take home! This workshop is sensory friendly. Tilles Center Family Workshops provide unique opportunities for families to play and explore the arts together. Storytelling, puppet-making, music and role-playing are some of the activities we offer, depending on the type of show being performed that day. Visit http://tillescenter.org/familyworkshops/ or call 516.299.3100 for more information and $5 tickets. For more information on The Rainbow Fish click here. Community Wellness Initiatives are generously supported, in part, by the Fay J. Lindner Foundation. Prices include a facility fee. Prices reflect a 10% subscription discount and include a facility fee.